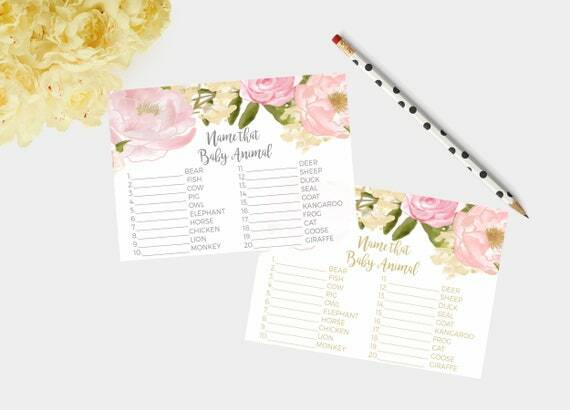 The cutest baby shower games! Available for you to download CREDITABLY. INSTANT DOWNLOAD game. *1 file with BOTH the PINK files in GOLD AND GREY font, Each page has two 5x7 games. *1 file with BOTH the BLUE files in GOLD AND GREY font, Each page has two 5x7 games. *Answer sheet (this only comes with the pink and grey font, but that said, the guests aren't going to see this, only the game host. *A set of FREE THANK YOU TAGS. I want to thank you by giving you a freebie. These signs are PDF signs, so you will need to print them at a full print shop, such as Staples, FedEx, Office Max, Officeworks etc. Stores that do printing on the side, such as Costco, Sam's Club, Walgreens, Big W etc print using compressed JPEG files given they use photo printing equipment. The print quality is not as good a a PDF print, which is the global standard in printing high resolution images. You can print this at Officeworks, Staples, Kinkos or FedEx, any print shop really, onto thick card stock, paper to frame or even foam backed card to add to your wedding decor.